Urban Archeologist: Wasn't Franklin Against the Stamp Act? 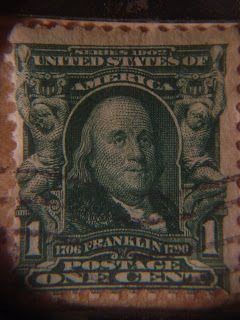 I'm not a philatelist, I've never even been to Pennsylvania, but I can't resist an old stamp when I see one. The image is a little dark because I'm still perfecting the art of macro-photography. I am into old paper and I don't care what it looks like or where it is, but if it has a date on it, I'm all over it. 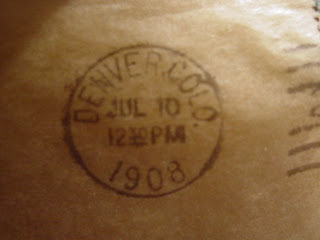 This was actually a pair of stamps that were affixed and canceled in 1908 on a unique envelope that was as translucent as onion skin. Most of the old envelopes I normally see have had the stamp un ceremoniously torn from it. 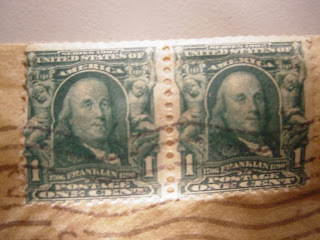 To me, the two are more interesting as a set and add provenance to a likely worthless stamp. Sorry Ben even at 100 years you are only worth a few pennies more than your face value. Then again, I am not ready to sell.